If the names Allie and Noah call to your mind two young sweethearts who in turn pull at your heartstrings, then chances are you are familiar with their creator, Nicholas Sparks. As one of the world’s preeminent storytellers, Nicholas Sparks has penned highly popular love stories for the contemporary reader. His works include novels turned motion pictures such as The Notebook, Message in a Bottle, A Walk to Remember, Dear John, Nights in Rodanthe, The Lucky One and The Last Song--tallying seventeen published novels and seven movie adaptations. In 2003 he co-wrote a moving memoir with his older brother Michael (Micah,) entitled Three Weeks With My Brother, chronicling their journey around the world while bonding over childhood memories of family tragedy and triumph. As the last remaining members of the family, the brothers bond while crossing international borders. Sparks finds inspiration in his surroundings, often using names, places and familiar stories in the weaving of his classic tales of love. Sparks’ tales are faithfully set in a small town somewhere in North/South Carolina and feature a love lost/love found theme. Screenwriting has also become a weapon in his arsenal. While Message in a Bottle was his first novel-based film, it was The Notebook that propagated his name amongst readers and moviegoers across the country and beyond. Big-name movie stars now jump at the chance to work with Sparks, whose movies have progressed the careers of Ryan Gosling and Rachel McAdams, and have also starred other A-list actors such as Kevin Costner and Paul Newman. Recently Disney Pictures purchased The Last Song screenplay specifically for the then seventeen-year old starlet Miley Cyrus. 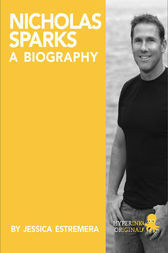 Sparks completed the screenplay for the film before he had written a single word of the novel. ...buy the book to continue reading!